Me: So what happened when you worked there? Mom: “So, the story goes that every summer the powerful forces of the area would take the life of a seasonal Glacier Park employee as the price to be paid for the encroachment of tourism. In 1967 there was the famous “Night of the Grizzly” where multiple young women were mauled to death by bears in more than one campground in the park. That was before I worked there. Later, in the summers of 1973, 1974, 1975 and 1976 there were employees who met their deaths respectively, as follows: 22 year old bellman had a heart attack and died while attending a Thursday night bonfire kegger, 21 year old hotel groundskeeper fell off a cliff and died while hiking, 86 year old gift shop clerk drove off a cliff and died; and a 19 year old kitchen worker slipped while taking photographs of a waterfall and fell only 10 feet but hit his head and died. Me: But it didn’t get you. This curse is interesting. 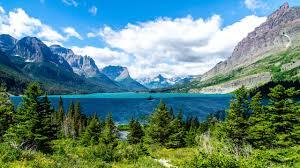 It makes sense that people would die in a place like Glacier National Park, simply because the great outdoors are a force not to be reckoned with. The consistency of the curse is a little unnerving– that every summer one employee would lose his or her life– not simply a reckless hiker. I do wonder if having a certain reverance for the curse, like the interviewee suggested, meant that she was less at-risk of dying. This could be correlation, in that people who are afraid of the curse take more precaution to stay safe, or it could be causation, in that the curse “sees” that you are afraid and therefore avoids you.